The second book in the Corduroy Mansions series was a bit more bizarre than the first one. 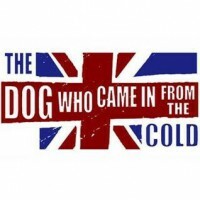 Terrier Freddie de la Hay is recruited by MI6 to use in a corporate espionage sting, there is a plot to steal Terrence's home, and also, there's a alleged yeti roaming around London. Despite the extremely odd plot line, McCall Smith makes this one, like the first in the series, a comforting, cozy read, focusing on home, family, friends, and neighbors. It's obvious that there will be a third book in the series, and I'll be reading that one as well.